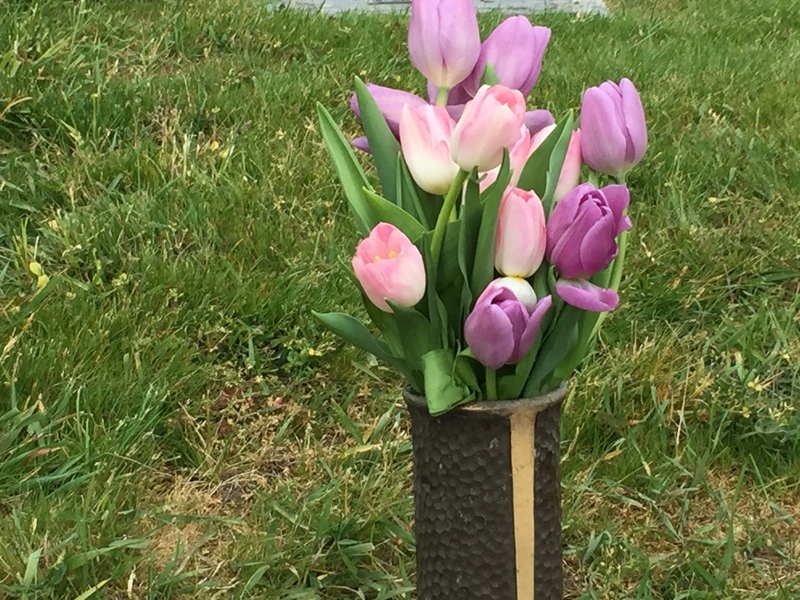 My aunt sent me this picture of the flowers she put on Grandma’s grave this year. I’ve written many times before about why Memorial Day shouldn’t be confused or conflated with Veteran’s Day — and I am hardly the only person to draw attention to that distinction (Washington Post: Why Memorial Day is different from Veterans Day, CNN: Get it straight: The difference between Memorial Day and Veterans Day, Washington Examiner: Why you shouldn’t confuse Memorial Day and Veterans Day NPR: Memorial Day Dos and Don’ts. Long before the Uniform Monday Holiday Act of 1968 made Memorial Day an official federal holiday, and even before the first federal observation of a day to decorate Union Soldier’s grave at Arlington National Cemetery back in 1868, and even before the Ladies’ Memorial Association of Columbus, Georgia suggested a day to honor those who died in the civil war there was another holiday observed in many parts of the country—long before the Civil War—called Decoration Day, which was a day to have family reunions and celebrate the lives of all of our deceased family members. It was usually observed on a Sunday in the spring, and frequently involved picnics in the cemeteries or potlucks at church. And my Grandmother was someone who observed that version faithfully her whole life, long before the official creation of the modern Memorial Day. Grandma always called it by the older name, Decoration Day. As I’ve written before, the original holiday was celebrated in many states as a day to gather at the grave sites of your parents, grandparents, et cetera, to honor the memory of their lives. It was often a time of picnics and family reunions. At least as much a celebration of their lives as a time of mourning. The connection to military deaths didn’t happen until 1868, and particularly in the south, was often seen as a pro-Union, pro-war, anti-southern celebration. I didn’t understand most of those nuances when I was a kid. The modern version of the holiday, celebrated on the last Monday in May, didn’t even exist until I was a fifth-grader, when the Uniform Monday Holiday Act went into effect. Grandma observed it faithfully. Every year, as May rolled around, she would begin calling distant relatives and old family friends. Grandma knew where just about every person descended from her own grandparents was buried, and she made certain that someone who lived nearby was putting flowers on the graves of those relatives by Memorial Day. She took care of all the family members buried within a couple hours drive of her home in southwest Washington. She was putting flowers on the grave of my Great-aunt Maud (Grandma’s sister-in-law) seven years ago on the Friday before Memorial Day when she died. 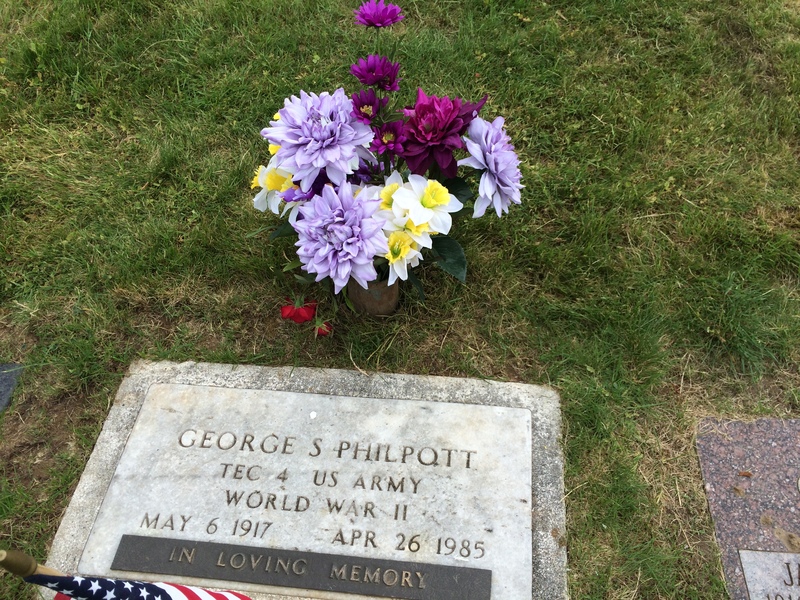 My step-grandfather said he was getting in position to take a picture of her beside the grave and the flowers (there are hundreds and hundreds of photos of Grandma beside graves with flowers on them in her photo albums) when she suddenly looked up, said, “I don’t feel good!” and pitched over. Grandpa had died 23 years earlier, and was buried in one of a pair of plots he and Grandma had bought many years before. And after Grandma re-married, she and our step-grandfather had bought two more plots close by. Anyway, as soon as someone asked that, my step-grandfather’s eyes bugged out, he went white as a sheet, and said, “Oh, no!” He was obviously very distressed as he hurried toward his car. Several of us followed, worried that he was having some sort of medical issue. Nope. He and Grandma had been driving to various cemeteries all week long before her death, putting silk-bouquets that Grandma had made on each relative’s grave. Aunt Maud’s was meant to be the next-to-the-last stop on their journey. Grandpa’s silk flower bouquet was still in the trunk of the car. My step-grandfather was beside himself. He’d cried so much that week, you wouldn’t have thought he could cry any more, but there he was, apologizing to Grandma’s spirit for forgetting about the last batch of flowers, and not finishing her chore—for not getting flowers on Grandpa George’s grave by Memorial Day. The next year, several of us had the realization that without Grandma around, none of us knew who to call to get flowers put on Great-grandma and Great-grandpa’s graves back in Colorado. None of us were sure in which Missouri town Great-great-aunt Pearl was buried, let alone who Grandma called every year to arrange for the flowers. Just as we weren’t certain whether Great-great-aunt Lou was buried in Kansas or was it Missouri? And so on, and so on. One of my cousins had to track down the incident report filed by the paramedics who responded to our step-grandfather’s 9-1-1 call just to find out which cemetery Great-aunt Maud was in. Flowers from us, Mom, and my Aunt Silly on Grandpa’s grave. 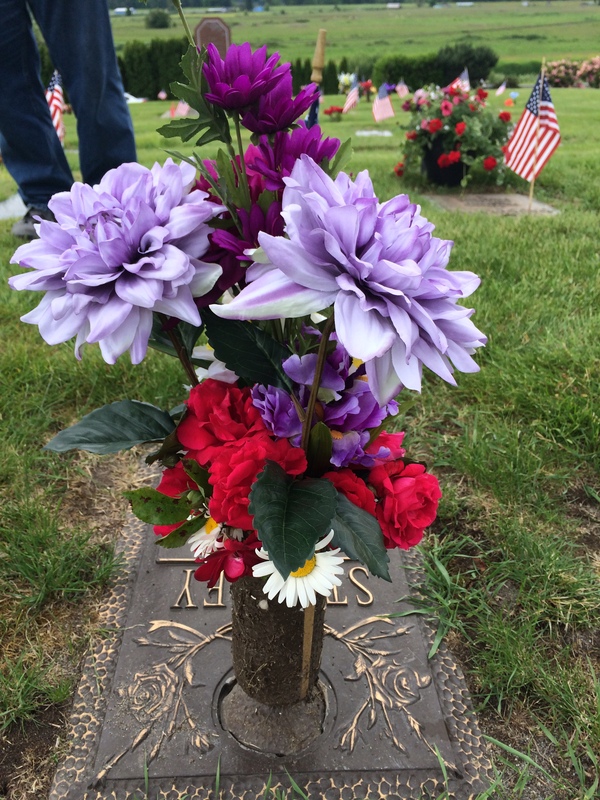 Mom and her sister have been putting flowers on Grandma’s and Grandpa’s graves since. Our step-grandfather passed away three years after Grandma, and he was buried beside her. Some years before her death, Grandma had transferred the ownership of the plot next to Grandpa to Mom. So Mom’s going to be buried beside her dad. Mom mentions it whenever we visit the graves, and I don’t know if she realizes how much it chokes me up to think about it. We had put the flowers in place. We had both taken pictures. Mom always worries that she won’t remember where Grandpa’s grave is (it’s seared in my head: two rows down from Grandma, four stones to the south). Michael helped Mom take a wide shot picture that has both Grandma’s and Grandpa’s spots in it. I thought we were going to get away with both of us only getting a little teary-eyeed a few times, but as we were getting back into the car, Mom started crying. Which meant that I lost it. And if you are one of those people offended if I don’t mention people who served our country in the armed forces on this day, please note that my Grandpa mentioned above served in WWII in Italy. Grandpa drove the vehicle that towed tanks that couldn’t be repaired in the field, and one of the two medals he was awarded in the war was for doing a repair of a tank while under fire. After the war, he came back to the U.S., met Grandma (who was at that point working as a nurse and trying to support her two daughters), and eventually married Grandma and adopted my mom and my aunt. Many years later, he was the person who taught me how to rebuild a carburetor (among other things). He was a hero many times over. And this post is also dedicated to his memory.